KIEV, Ukraine -- Interior Minister Vitaliy Zakharchenko may have secretly watched opposition protests and street clashes in Kiev on Saturday from a rooftop terrace of a nearby building, a news website reported Wednesday. A picture, taken on Saturday and published by hvylya.org website on Wednesday, shows three men, one of whom strikingly resembling Zakharchenko, on the terrace of the Intercontinental hotel. The hotel is across the street from where a mob, thought to be hired by the ruling Regions Party, attacked two reporters on Saturday, triggering a major scandal. The hotel’s location allows simultaneously watching events unfolding at St. Sophia Sq., St. Michael’s Sq. and Velyka Zhytomyrska Street, all key venues of the opposition protest on Saturday. A spokesman at the Interior Ministry on Wednesday was not available to comment on the picture. The publication of the picture may increase pressure on Zakharchenko and raise further questions about his role and the role of the police in the developments that had led to street violence. “The mere presence of the head of police [on the rooftop] is not a crime,” the report said. Zakharchenko on Tuesday was summoned up to Parliament to report on the clashes, but was able to say little besides alleging the opposition groups had been responsible for the violence. Opposition groups accused Zakharchenko of trying to cover up the attack amid mounting evidence that the mob, later identified as martial arts fighters from Bila Tserkva, had been associated with the Regions Party. Arseniy Yatseniuk, the leader of the opposition Batkivshchyna party, alleged the clashes were organized and coordinated by a special team set up at the Interior Ministry. 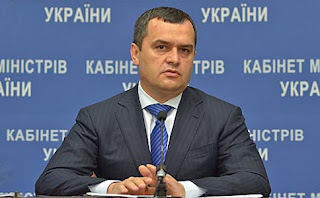 Yatseniuk said Andriy Kliuyev, the secretary of the National Security and Defense Council, a top security body under President Viktor Yanukovych, was allegedly in charge of the operation. Yatseniuk cited undisclosed sources at the interior ministry for his allegations. The street clashes and the attack on reporters followed an incident with an armored personnel vehicle, which had been moving along Velyka Zhytomyrska Street towards the opposition rally on St. Sophia Sq. The vehicle carried a man dressed in a rabbit costume and holding a giant carrot. The caricature performance was believed to be targeting Yatseniuk in an attempt to diminish him in front of thousands of his supporters. The vehicle was stopped by the protesters, a development that led to the clash with the mob and later escalated into the attack on reporters. When asked about the armored personnel vehicle and how was it possible for it to appear on the street of Kiev, Zakharchenko said on Tuesday it was part of the opposition entourage. But footage uncovered by reporters show the vehicle was accompanied by police cars throughout the city until reaching Velyka Zhytomyrska Street. At least one picture showed a smiling police officer inside the vehicle. 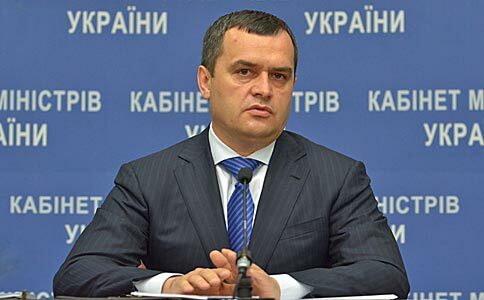 “The Interior Ministry as a powerful, decent, honest leader who can set an example to the personnel of the ministry is no more in Ukraine,” Oleksandr Dubovoy, a member of the opposition Batkivshchyna party, said. “How can an ordinary police officer feel himself and act morally if the interior minister is so dishonest and telling a lie to the Ukrainian people,” he said. Why does this sound like Obama in USA?